“Please confine yourself to discussing your own sister’s anatomy,” Yohanan said as he smeared iodine paste on the gash in Josh’s shin. He used his whole slender arm, moving it from the shoulder, where any other medic would use only his wrist and hand. Yohanan was smiling despite himself because Josh, lying back on his elbows on a scratchy slate-colored army blanket spread over the yellow grit of the Negev borderland, had mispronounced the expletive, as he mispronounced most everything he said in Hebrew. Josh grimaced and grabbed the grimy purple kipah off Yohanan’s buzz-cut scalp. He kissed it, replaced it, and gave Yohanan the finger. The sun hung heavily over the plain to the east, behind a scrim of dust, as if it had barely risen this far and would go no further. Another blanket lay behind them, not smooth but lumpy. Something small underneath. “You’re good to go,” Yohanan said, rolling down the leg of Josh’s fatigues and slapping him on the knee. Sergeant Eliezer, the only one standing, eyed his friends as he swayed, running his left hand over his beard and then clasping it, before him, to his right. “What do you expect from them, they’re animals, those Sudanese,” came the muffled voice of Modai. The stocky machine-gunner, lying flat on his back in the sand, had placed his hat over his face. “And here I thought they were human beings like us,” Yohanan said, packing his medical gear back into his vest. Josh’s fingers dashed over his iPhone and had the translation in hand in just a few seconds. “Righteousness exalts a nation; benevolence for a people is a sin,” he read out, just as Gamliel strode over. Yohanan poked Modai and hissed “company commander!” Modai peeked out from under his hat and sat up. “What was that?” Gamliel asked. “Tzedakah teromem goy; ve-hesed le-umim hatat,” the sergeant said. The expression on his face differed from the others. It was defiant, almost hostile. Gamliel ignored him. “Sit down all of you. Give me the story.” The soldiers formed in a semi-circle in front of him, holding their M16s between their knees or on their laps, avoiding the gaze of the sun. “We were there in a flash, I drove like a maniac,” Modai crowed, but Gamliel shushed him. 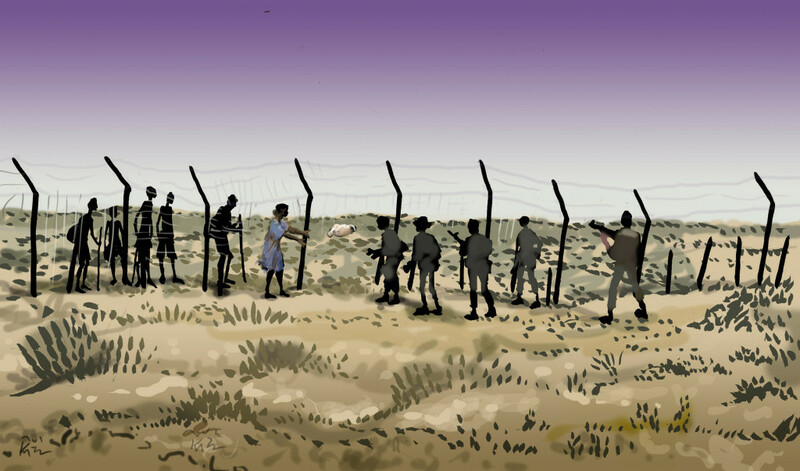 “Eliezer.” Gamliel said it firmly, jerking the rifle hanging from his right shoulder. “She just kept at it,” Eliezer said. “‘Halt or we will shoot!’” Josh called out. “Pow!” That was Josh. Yohanan glared at him. “It was a baby!” Yohanan’s eyes were intent on a pebble he was tossing in the air. “‘Hadal!’” Josh called out. “She shouted ‘Hold your fire! Hadal!’ In English and then in Hebrew!” He looked around at the others. “I was covering from the jeep. I saw it,” Modai confirmed. “‘Righteousness exalts a nation; benevolence for a people is a sin,’” Eliezer reiterated. “Calm down. This is a military debriefing, not a yeshiva,” Gamliel ordered. Eliezer was about to protest but Yohanan gave him a warning look and he thought the better of it. “Nehuniya!” Modai shouted. Then he explained to Gamliel what Gamliel already knew: “It takes him a long time to pray.” At that moment the missing soldier appeared, as haphazard as Eliezer was groomed, his beard scraggly compared to Eliezer’s carefully trimmed one, his sidelocks swaying in the breeze. He kept his left hand almost permanently on the topknot of his filthy white knitted Nahman cap, moving it a centimeter this way and an inch that. He still had his tefillin on. “We should read it this way,” Nehuniya suggested. “‘Righteousness exalts a nation, it is benevolence, for other people is a sin.’ All the good words for us, guys.” He giggled. “You were there?” Gamliel glared. Nehuniya nodded. “An offering on the altar in the Temple. To cleanse you of your sins,” His voice sounded as if it came from far off. Josh slowly rolled up the leg of his fatigues and gazed at the bandage. “My blood …” he said. His voice trailed off. He choked. Gamliel looked behind him. Was the sun setting in the east? “Where’s the baby?” he asked. Yohanan jerked his head at the lump behind them. Josh rose to his feet, walked heavily to the blanket, and picked it up, together with the small body it covered. Shaking, he walked back and presented it to Gamliel, who stepped back and refused the offering. “It’s my sin,” Josh said. “Or is it hers?